I met Andrea a few years ago at a writer’s conference. Later we began carpooling together to our local chapter of American Christian Fiction Writer’s meetings. We had so much fun we became not only friends, but critique and accountability partners for our writing and pray for each other over all the ups and downs of life and writing. I’m glad you got meet her! When did you decided that you would be an author? Was it something you fell into, felt called to… ? I started writing as a child. My earliest recollection of actually producing a work of fiction, was when I was in 4th grade. I wrote a story called “Little Miss Mouse.” Each day, on my way home from grade school, I used to stop at the library and write. I was quite proud of my lined notebook and penciled story. Little did I realize my mother kept it. I found it among her belongings after she died in 2012. Cleaning my house. Seems such a waste of time. It just gets messing/dirty again. Realizing that a proposal I had sent to an editor had many, many misspellings in it. The slow pace at which I now write. It didn’t always used to be that way. In the 1990s, I could write four 50K word novels and one novella per year. Now it takes me a good four to six months per book! My first book was published in 1994 by Heartsong Presents (Barbour Publishing). Since then, I’ve written some 40 books, fiction and nonfiction. Therefore, the way I process rejection and negative views has morphed greatly over the years. While once I let such things ruin my day, now I don’t let it rent space in my head. Too many characters live there anyway. Writers cannot take rejection personally. It happens. It’s a part of being a writer and journeying toward publication. As for negative reviews…if a reader states something like, “The book was too boring. I set it down after two pages.” I consider the comment, but compare it to the other reviews posted. If all other reviews (except that one) are glowing, I discount it as merely one reader’s viewpoint. But if the majority of reviews are negative, I take them to heart AS A LEARNING EXPERIENCE and try to figure out how I can make my next book better. I have helped at least a dozen authors get published and when I see their success, I rejoice. They are precious gems in the crown I will lay down at my Savior’s feet someday. I love to encourage other writers which is one of the reasons I partnered with Lynn Coleman, Tracie Peterson, and others to begin ACFW (American Christian Fiction Writers). 1) Don’t give up. 2) Work on being the best author you can be. 3) Rejoice with others when they share their good publishing news – even if you’re feeling envious you can’t share similar news. Amazingly, God will use that for His good – and I speak from personal experience. I’ve actually got more than one WIP because, even though I might not actively be working on a book, it’s still percolating in my head. Too Deep for Words, book 2 in my Shenandoah Valley Saga (coming February or April 2017). After it’s finished, I plan to work on revisions for a super cute novel for Prism Book Group that I’ve tentatively Building a Dream. I can’t wait to dive into that project. After that, it’s on to a secret fiction project that I can’t yet discuss (but I can tease about…ha, ha…) I’ll follow that novel up with writing There Is a Season, book 3 in the Shenandoah Valley Saga. Andrea Boeshaar is a prolific writer and gifted story-teller. This trilogy of novellas in one package illustrates that beautifully. 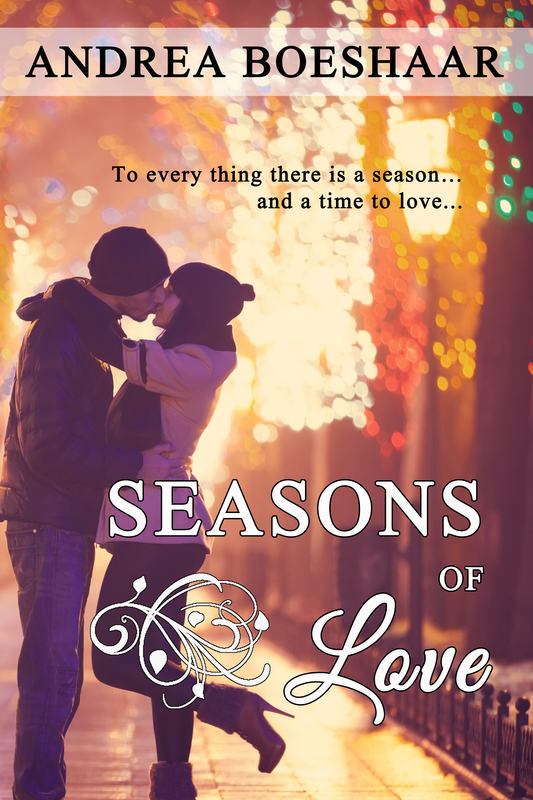 Seasons of Love is a trifecta of contemporary inspirational romance. And for a limited time the ebook version is only .99! Merry Christmas to YOU! The first novella, An Apple a Day takes place in summer. Dr. Brian Coridan is taking a break from his private practice. While in Blossom Lake, Wisconsin he becomes infatuated with the local health food store owner, Talia Fountain. Their philosophies about medicine are at opposite ends of the spectrum and yet sparks continue to fly between them. A sweet romance that is just what the doctor ordered. And a recipe for apple pie is included! The second novella, September Sonata, tells the story of Krissy and Blaine. They have entered the empty nest season of life. Set in the Milwaukee, Wisconsin area, Blaine is recovering from an accident while fighting a fire. Pain is his constant companion but he loves his wife and can’t understand what’s gotten into her. Krissy is bored in the marriage and when the new Christian school principal shows interest in her she struggles inside. Does she honor her vows and what would staying married to Blaine look like in the years to come? Andrea has a sweet surprise for the reader and a spicy one as well in a chili recipe at the end of the story. While I’ve enjoyed all the stories, for some reason the last one is my favorite. In Let it Snow, Shari Kretlow finds herself stuck in a snowstorm, on Christmas Eve at the home of the family of the man she deserted long ago. She’d run off with another man but life and marriage were far from happy for her. Now a widow with an unspeakable joy and determination to live life happy, she’s confronted with the man she left. Dr. Brenan Sheppard never really recovered from Shari’s betrayal. Home on leave as a missionary in Brazil he’s on the cusp of proposing to someone else. Shari’s appearance brings up old feelings he thought he’d buried. Now he has to decide what to do with that. Can love lost be restored? This story includes an egg bake recipe at the end of it. If you like stories on the shorter side with a sprinkle of love, faith and food woven in, you’ll love Andrea’s trilogy.